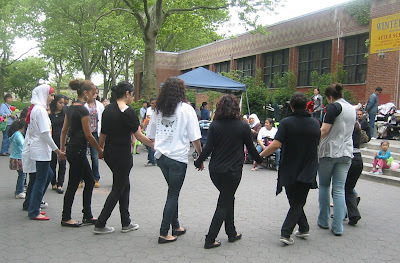 This year, the Sunset Park Recreation Center hosted Arab American Service Day. I had no idea it was going on, but on my way to a park-side coop's stoop sale (that never materialized, what a tease! 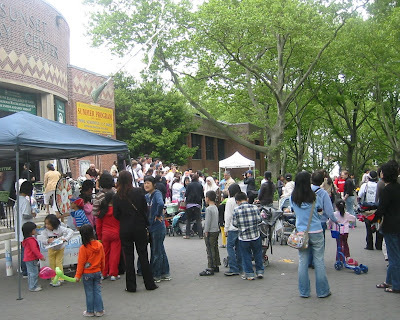 ), a neighbor informed me that there were lots of activities up in the park. 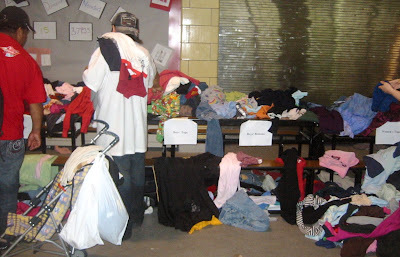 There was a free market with tons of clothes and items; I saw many people leaving with trash bags full of clothing. And, most importantly for my kid, there was a very pleasant woman creating animals out of balloons. Sadly, she seemed to think that a flower balloon he wanted was inappropriate for my son, so he settled for a dog balloon. Maybe she had run out of the other ones. Oh! There was also a prize wheel that had mini first aid kits and bags as prizes, among other things. You never know what you'll find when you venture into Sunset Park. This makes me wonder -- where's the best place to drop off used clothes, books, and household items in Sunset Park? Thanks! SPAN is trying to start a monthly free market in the area. In the meantime I just leave boxes of stuff in or by the park, with a sign of course.